Terror goes to extremes in this reimagining of the Jason legend for today's horror fan. Enter for the first time the subterranean lair that is Jason's den of torture and fear. See him discover the mask that hides his deformed face. Experience a whole new level of fright. And try to remain calm. The intense violence, the unique kills, the jolting scares: live them all in the all-new Friday the 13th! $43.585 million on 3105 screens. When will the parade of horror remakes end? Never, I’m guessing – at least as long as they make money. Since the majority come with very low budgets, it becomes easy for them to turn a profit. Case in point: 2009’s Friday the 13th didn’t light up the box office with its $64 million take, but given its $16 million cost – and the successful home video afterlife horror flicks enjoy – the remake made lots of money. The 2009 Friday starts with a flashback to the original flick. It shows the demise of crazy Mrs. Voorhees (Nana Visitor) on June 13, 1980, and we see deformed young Jason (Caleb Guss) emerge from the shadows. From there we leap to present day. A group of backpackers goes in search of a hidden stash of marijuana, and they end up at the old Camp Crystal Lake location. This doesn’t end well for them. Six weeks later, Clay Miller (Jared Padalecki) goes to find his sister Whitney (Amanda Righetti), one of the missing backpackers. He comes across Trent (Travis Van Winkle), a rich college kid who brings his friends to stay at his family’s lakeside vacation home. While Clay searches for Whitney, the others party – and eventually encounter the adult, homicidal Jason (Derek Mears). This also doesn’t go well for them. When I went into the 2009 Friday, I expected a fairly straight remake of the original. Instead, it takes the Superman Returns route and appears to essentially ignore the existence of all the sequels. Granted, it doesn’t overtly deny them, but it seems to act as an extension of the 1980 flick and shows no indication that all of the Jason-centered adventures from 1981 to 2003 existed. I like that twist, and the 2009 Friday also offers a few other shifts from the genre clichés. However, I don’t think it shakes things up enough to merit a successful reinvention. A lot of the problem comes with the thin nature of the premise. 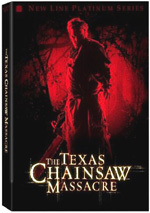 Director Marcus Nispel offered a reworking of The Texas Chainsaw Massacre that I thought topped the original film. However, that flick’s story had more potential depth to it, whereas every Friday movies revolves around little more than “crazy freak hacks up people”. Oh, the series occasionally tried to flesh out background a little better, but the situations and scenarios remained painfully similar. That means the series lives and dies with its kills. I think that’s what the fans most like about the movies: the various methods Jason uses to dispatch his victims. During the opening sequence with the backpackers, Nispel accomplishes a good level of intensity and creates murders with more punch than the usual gross-out scenes. For instance, Jason roasts a backpacker in a sleeping bag. That segment transcended the standard icky slash ‘n’ hack to become genuinely horrific. Had the rest of Friday been similarly off-putting, the movie might’ve delivered more of a punch. Instead, Nispel goes with a generic recitation of the same old bloody nonsense. Of course, these scenes are also pretty horrifying – much gore ensues – but they’re so over the top that they don’t really scare us or make us upset. And that’s probably fine with the franchise’s fans, as they want to see bloody kill after bloody kill. I just would’ve liked to see the series take a different path, and the opening led me to think it might do that. The Jason of the first 20 minutes seems more suited to the 21st century than does the campy goof of the older films; the early Jason here just comes across as more genuinely unsettling. After that fairly powerful opening, however, Friday settles into the same routine that marks virtually every other movie in the franchise. We meet a slew of attractive – and utterly expendable – young adults and watch them get killed. Again, a few minor twists occur, but for the most part, the new Friday just regurgitates the tried and true formula. If that works for you, have fun. I can’t say that I genuinely disliked the new Friday, because I didn’t. For better or for worse, it fit with the series’ traditions, so I can’t criticize it for remaining true to form. Heck, it’s even better than the original Friday, though that’s not saying much; the 1980 film was popular and influential without actually being any damned good. 2009’s Friday the 13th isn’t particularly good, either, but it’s not bad. I do see it as a missed opportunity, though. It could’ve taken the franchise down a creative new path but instead preferred to stay with the same old hack and slash. 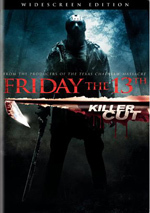 Note that the DVD reviewed presents an extended “Killer Cut” of Friday. It runs 106 minutes, which means it adds about eight minutes to the 98-minute theatrical version. Since I never saw the latter, I can’t comment on the changes. Nonetheless, I wanted to mention the fact that the DVD provides an alternate cut. Friday the 13th appears in an aspect ratio of approximately 2.35:1; the image has been enhanced for 16X9 televisions. The transfer seemed good but unexceptional. Sharpness usually worked fine. Some wide shots could be a bit soft, and I noticed sporadic instances of jagged edges and blockiness. Still, most of the movie looked pretty accurate and concise. A little shimmering appeared, but I noticed no edge enhancement, and source flaws were completely absent. Friday featured a generally natural palette. It took on a slightly golden tone but usually seemed pretty robust. The colors were clear and well-represented. Blacks also seemed good overall, but shadows were a little dicey, as some low-light shots were more opaque than I’d like. Nonetheless, the transfer was positive enough for a “B”. I also found the Dolby Digital 5.1 soundtrack of Friday to be pretty decent. The soundfield really only came to life during a few action sequences. The opening rampage provided fairly good material from the side and rear speakers, and the climax also used those speakers to reasonably positive effect. Otherwise this was a mix heavy on atmosphere. Those elements created a nice sense of place but lacked a lot of active material. Only minor extras show up here. The Rebirth of Jason Voorhees runs 11 minutes, 23 seconds and provides comments from producers Andrew Form and Brad Fuller, director Marcus Nispel, writers Mark Swift and Damian Shannon, special effects makeup artist Scott Stoddard, and actors Derek Mears, Jonathan Sadowski, Willa Ford, Danielle Panabaker, Nick Mennell, Amanda Righetti, Julianna Guill, Kyle Davis and Travis Van Winkle. “Rebirth” looks at the reinvention of the series and story elements, cast and characters, makeup effects, and an alternate scene. Should you expect more than fairly standard promotional material here? Not really. We get a decent look at the Jason makeup, and we learn why they reshot a sequence that we’ll find in the “Additional Scenes”. Otherwise, there’s not much meat here. It’s watchable but insubstantial. Three Additional Scenes last a total of eight minutes, 20 seconds. One expands the killing in which Jason gets his hockey mask, while shows the call that brings the police to help Clay and the others. For the final clip, we get an alternate ending. Scene one is superfluous; scenes two and three are a little more worthwhile, but they would’ve slowed the film when it doesn’t need to decrease its pace. Scene three would’ve fit the final cut the best since it includes action, but I think the existing ending fares better since it more closely connects to the original film. A few ads open the disc. We get clips for Blu-ray Disc, Freddy Vs. Jason, Green Lantern: First Flight, The Cell 2, Trick ‘r Treat, and Observe and Report. No trailer for Friday appears. While I’ve enjoyed a few of the modern horror remakes, the new Friday the 13th does little to improve the old model. Indeed, it feels like more of the same but with 21st century production values. The DVD offers good picture and audio but skimps on supplements. Leave this one to Friday buffs, as it seems unlikely to entice new fans.